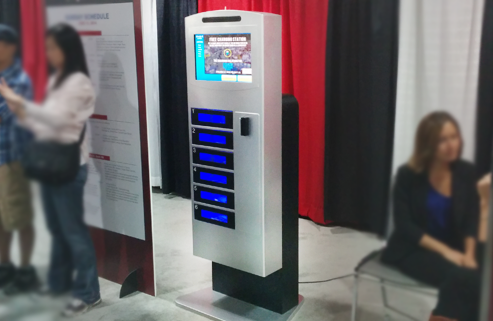 Veloxity, an industry leader in secure, charging solutions, is releasing data collected from its phone charging stations across the country. Using the usage analytics that we’ve included in our charging stations, we were able to compile data on how users interact with our products. From professional events like trade shows and conferences to social events like galas and corporate outings, our data suggest that providing phone charging stations at events can have a significant impact on its success. We approached the research in two segments: guest retention and guest engagement. Guest retention was measured by gauging the impact of our phone charging stations on the length of a guest’s stay. This measurement was conducted at multiple events across the country where Veloxity’s machines were featured. We found that the average guest stayed 17% longer at conventions and 14% longer at trade shows. Getting the guests to stay is only half the story. We also measured for guest engagement, arguably a more crucial statistic in the events industry. In an era where social media and traditional communication go hand and hand, we recorded the average time a guest would talk with a trade show presenter and the number of social media hits about the event on Twitter, Facebook, and Linkedin. Guest engagement rates increased at trade shows and conferences by 12% and 3% respectively. For conferences, a charging station allows for more guests to have more battery life, leading to more social media interactions. In trade shows, guests who left their devices charging visited more exhibits and stayed for a longer time. Furthermore, exhibitors noted that guests seemed more attentive, less distracted, and more engaged. Supplying guests with a secure place to charge their expensive phones will draw a lot of attraction. As these trends continue, Veloxity seeks to make access to cell phone power as easy as WiFi access today.